Alan M. Dershowitz is the Felix Frankfurter Professor of Law, Emeritus, Harvard Law School. He joined the faculty at age 25 and at just 28, became the youngest full professor in the Law School’s history. 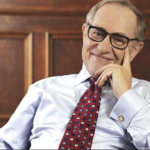 Professor Dershowitz has published well over 1000 articles, has written more than 30 books, has taught subjects ranging from philosophy to delicatessens, has advised many world leaders and participated in some of the most famous precedent-setting legal cases of the past fifty years. For Professor Dershowitz’s full bio, please click here. Enjoyed listening….he certainly lives……AFull Life !! How wonderful you got to sit with him. I’m sure, if his ticket were “punched” ….he would have made a huge difference in our history’s path! steven, that was so so so so good. will make estair and jacob listen. she studies the arab israeli conflict as part of history in grade ten. and oh all that about golda meir, gertrude stein, the rhodes island jews who might have been saved, the eastern european jewish civilisation, the thoughts on genocide, actually every minute of the interview… wonderful. and having worked in advertising for many years, i had to giggle at the clients quip.